Two years ago John Brandrick of Cornwall, England was diagnosed with Pancreatic Cancer and told he had a year to live. Brandrick decided that you can't take it with you when you go and spent everything he had living up his last year on earth. Unfortunately, it turns out he wasn't dying; he just had an inflamed pancreas. Now Brandrick is asking the hospital that diagnosed him to compensate him for the money he spent on his lavish lifestyle over the past 2 years. If necessary Brandrick will sue, the hospital says that given the evidence, they made the correct diagnosis. Minus the lawsuit, this is the exact plot of the Queen Latifah movie Last Holiday AND the Tom Hanks favorite, Joe Versus the Volcano. 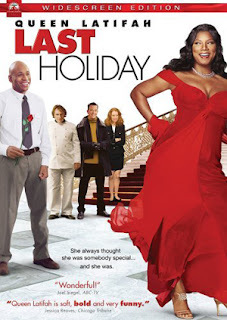 Since I'm sure nobody but me saw Last Holiday, I will fill you in. Queen Latifah plays a New Orleans store clerk who always plays it safe. When she is told she has only 3 weeks to live, she heads to Europe to blow through her 401k and meet her culinary idol Chef Didier (played by Gérard Depar-don't). Some stuff happens with L.L. Cool J (the guy she's in love with) and some other stuff happens...I don't really remember much about it to tell you the truth. I blacked out because it is a pretty terrible movie. But I know that at the end she doesn't sue the hospital that misdiagnosed her. In fact, the opposite, she thanks them for giving her the courage to live her life. I am also certain that Joe from Joe Versus the Volcano didn't sue the hospital that provided the misdiagnosis that convinced Joe to agree to be sacrificed to a volcano in exchange for the cash needed to live up his remaining days on earth. I walked out of both of those movies saying "That would never happen! People in the real world get 2nd opinions before they spend all their money, stop paying their mortgages, and give away all of their possessions". It is nice to be proven wrong every once in awhile. It is also nice to have a reason to talk about Last Holiday.